CAPE CANAVERAL, Fla. ? 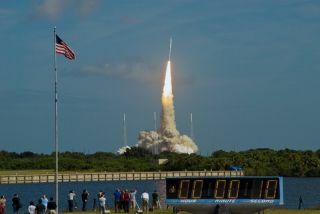 The apparent success of NASA?s firsttest flight of a new experimental moon rocket has the American space agencybeaming with joy. The Ares I-X booster soaredinto the sky on a two-minute mission to test out a brand-newrocket design intended to carry humans back to the moon. The short flight,just six minutes in all, comes as the White House reviews NASA?s spaceflightfuture. "It was a spectacular day," said a jubilant AresI-X mission manager Bob Ess after the launch. "The vehicle flew evenbetter than we expected." After hours of waiting out cloudy weather, NASA seized on anarrow patchof clear sky to loft the vehicle at 11:30 a.m. EDT (1530 GMT) from theKennedy Space Center here. The flight cost $445 million and marked NASA?s firsttest of a new rocket for human spaceflight since the shuttle?s 1981 debut. "We worked methodically, listened to the vehicle andlet the vehicle show us it was ready to fly," said Jeff Hanley, head ofNASA's Constellation program, which encompasses Ares I-X. "We were readywhen Mother Nature was ready, and we took our opportunity, and what a greatoutcome. It flew straight as an arrow." By all appearances, the untried rocketperformed stunningly, though it will take engineers months to fully analyze thetrove of data the flight provided. Over 700 sensors on the booster, pluscameras on the ground and an airborne plane, returned meticulous readings ofthe rocket's trip to study how much the rocket rolled, how well the parachutesdeployed to carry the first stage booster down safely, and myriad otherparameters. Engineers are particularly interested in data surrounding the rocket's first stage separation, which occured two minutes into the flight. The unpowered dummy upper stage appeared to begin tumbling earlier than expected shortly after the two stages separated. "The vehicle flew well and we're going to get a lot ofdata back," said Doug Cooke, director of NASA's exploration systems. "We're going to learn a lot to stand us in a good stead for thefuture." The flight was a milestone for the planned Ares I rocketprogram, slated to replace the space shuttles after they retire. "It's a sense of validation that the course that wehave laid out is executable," Hanley said. "An early demonstrationlike this puts aside any doubts in our minds, if we had them, as to the flyabilityof this particular design. We have a design that will do the country service ifit is put into service." The flight comes at a tenuous time for NASA, when the futureof American human spaceflight is up for review by the Obama administration. A recentreport commissioned by President Obama called into question whether Ares Iwould be ready by 2015 as planned, and whether it even makes sense to build therocket, or if perhaps commercial companies could step in to create the nextvehicle to carry astronauts to low-Earth orbit, freeing up NASA to focus on alarger heavy-lift rocket. The report suggested that Ares I may not be readyto launch astronauts aboard Orion craft until 2017, though NASA maintainedWednesday that 2015 is achievable with sufficient funding. "Think about what we just did," launch director Ed Mango told flight controllers just after liftoff. "Our first flight test, and the only thing we're waiting on is weather." Whatever the ultimate fate of Ares I, mission managers saidthe test flight was worth it. The successful flight does help establish AresI's feasibility, mission managers said. "This test will be a value regardless of any decisionsin the future," Cooke said. "Were learning about validating ourmodels. It's about learning form it."